Okra Soup is the choice Nigerian soup when you want to start giving your toddler adult food. This is because not only is Okra Soup very rich in vitamins, it is also very easy for the kids to swallow due to its slimy nature. And it tastes good too! 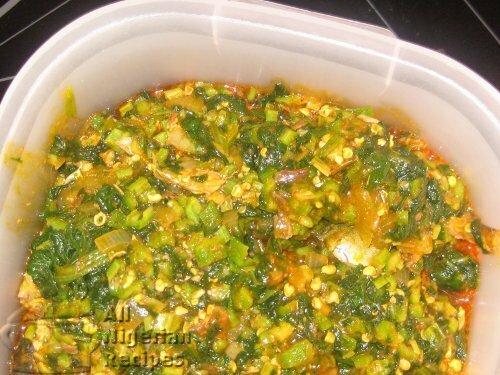 There is also the classic Okro Soup for grown-ups which has more added ingredients. Cut the okra fingers into tiny pieces. Grind the crayfish. Wash the pumpkin leaves, if it is your choice of vegetable, and cut into tiny pieces. If you will use spinach, defrost and cut into tiny pieces. Wash, cut and boil the iced fish. Leave to cool and debone. Pour red palm oil in a clean dry pot and heat to dissolve the oil if it is congealed. Add the diced okra and start frying on medium heat, add some fish stock (or water) from time to time till you notice the okra start to draw. 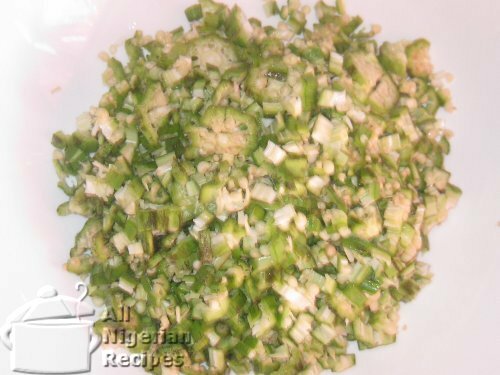 This process should take a maximum of 5 minutes to avoid over-cooking the okra. Now add the ground crayfish, the remaining fish stock, pumpkin leaves, a pinch of salt and the fish and stir well. Cover the cooking pot and leave to simmer for 5 minutes. The soup is ready to be served with mashed potatoes, Semolina or Pounded Yam.